ITALY - The Miscano river has its source near the top of Mount La Difesa (ca. 1100 mt. 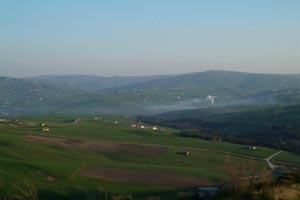 on the sea level), in Faeto territory (Foggia province), flows south-westward for about 35 km. at the foot of the Dauni mountain ridge, and ends its course mixing its waters into the Ufita river, at the foot of Mount Rocchetta, in Apice territory (Benevento province). The Miscano valley is a natural passage through the central-southern range of the Apennines, and has been since Prehistory the hub of transports and transit linking the Adriatic and the Tyrrhenian seas.·Throughout the Miscano valley, for almost all its length, runs the well known Tratturo (in modern times named "Tratturo Pescasseroli-Candela"), a transhumance green track opened originally by free-roaming animals migrating alternatively between mountain and plain pasture lands, and later on by man organized transferring of live-stocks between Abruzzi and Apulia regions which is a testimony to the human presence in the valley from time immemorial. Not far away from the grass road of the Tratturo, at La Starza, in Ariano Irpino countryside, there is an archaeological site of the early Neolithic age, whose artefacts, it's a pity, but have been entrusted to three different archaeological museums, those of Ariano Irpino, Benevento and Avellino.·At the times of ancient Rome this place was the meeting point of two Roman main ways: the Herculean and the Trajan roads. ·"It's exactly due to this privileged position if the settlements here established on the course of time have developed after one of the more ancient European Neolithic communities was founded there; settlements which contributed to the stable, rich and complete consolidation of the proto-historic cultures, from the VI Millennium B.C. until the Iron Age" – writes the archaeologist Claude Albore Livadie.·The village was founded at the top and at mid-slope of a hill by groups of agriculturalists who abandoned more ancient communities of farmers situated along the Adriatic coast and in the plain of Apulia (the "Tavoliere"). The founders of La Starza chose that place at the interior of the land and in proximity of a river valley because the village would be more easily defended and thrive in a more favourable geographic position. And its long duration in the proto-history proves that that choice was a good one. La Starza shared the highly developed impressed ceramic styles of the Guadone culture (Foggia province), maintaining with it a close relationship.·At those times man had already become agriculturalist, reared live-stock and made ceramic pottery: before that time he was a nomad, now he is a sedentary village dweller. But before La Starza was inhabited, the Tratturo already existed, as many elements let us infer, and it was then a grass track opened by the migrating animal herds themselves, as the buffaloes did in North and South American grass lands. 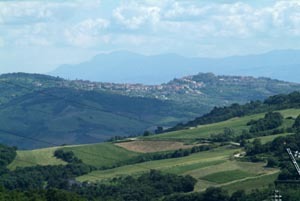 After La Starza ceased as an inhabited community, its territory was urbanized by Samnites and Romans. Nearby La Starza there is the archaeological site of Aequum Tuticum (IV cent. B.C. to A.D. IV cent. ), first a Samnite and afterwards a Roman township. In Buonalbergo countryside, at the top of Mt. 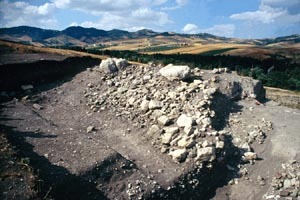 Chiodo, there are well preserved defensive walls structures of a Samnite oppidum (a walled hill fort), of the IV cent. B.C. At Casalbore, not far off, there is on a hillside a necropolis; an ancient holy place very enchanting which has been preserved for 2600 years. Also at Casalbore there is the archaeological site of an ancient Italic temple (IV to III B.C.). Downhill there are ruins of ancient bridges which pertained to the Via Traiana . Those bridges spanned at that time rivers and other minor streams whose water-flow was not so meagre as today. 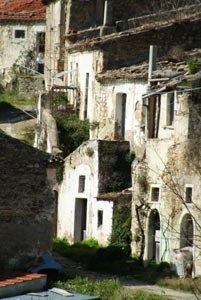 Also in Buonalbergo there is one of those bridges called Ponte delle Chianche which has still four well preserved arches; other bridges remains are in Santo Spirito (the Devil Bridge) and in La Cristina localities in Montecalvo Irpino countryside, all of them bridges of the Trajan Road which connected Benevento to Brindisi. This road was built in two years' time (108-110 A.D.) and was inaugurated by the emperor himself, in 114 A.D. together with the splendid arch gate of Benevento. At the fall of Roman civilization, the cities and villages of the valley kept losing their inhabitants because they preferred as dwelling places more protected spots on hill and mountain tops; and so new villages and communities rose in the Middle Ages. These communities overlook the Miscano Valley river banks from the hilltops. And in these ancient towns and in their traditions one can discover a cultural melting pot very stratified notwithstanding it isn't so large a territory, which makes it an unequalled example in Europe. At Faeto (Foggia province) the inhabitants speak the French-Provensal langue d'oc; at Greci the Arbereshe language of Albania, since the end of the XV cent. A.D. In Montecalvo Irpino, portal ornaments in the historical centre show byzantine and even pre-colombian motifs, the latter ones brought from America by Spanish lords who dominated the Two Sicilies Kingdom for more than two centuries. Before them in our territory arrived Lombard and Normand invaders; the latter built castles in Ariano, Casalbore and Montecalvo. The Lombard masters brought exquisite golden crafts in our territory, In Casalbore countryside the Lombard built an underground chapel dedicated to Saint Michael that most certainly was a resting place along the Via Sacra Longobardorum which reached the famous Lombard sanctuary of Saint Michael Archangel on Mount Santangelo, a promontory overlooking the Adriatic sea, in Apulia. Originally the Via Sacra went from Benevento and Spoleto to this sanctuary, and later on even from Mount Saint Michel, in the North of France. In Middle Ages the communities became fortified places on hilltops; the typical medieval townships whose feudal economy endeavoured to be self sufficient and men extracted life resources by labouring with scarce and poor tools a very barren soil. The valley, however, remained at the centre of numerous important roads, along which journeyed also the crusaders going to Terra Santa. Moreover, in Montecalvo remains wall and other structures of an ancient hospice (the Ospedale di Santa Caterina) which was destined to host pilgrims journeying to and from Jerusalem. During the Angevin and the Aragonese dominations the ancient Tratturo was valorised again as a transhumance track for the alternative seasonal migration of livestock (essentially sheep). ROMA. FEDERICA UBERTONE FINALISTA AL PREMIO "SINESTESIE"